Of all of Monet's impressionistic masterpieces, his paintings at the gardens at Giverny is one of his most popular. In Monet Lake Giverny II tapestry we see a detail from one of his most popular paintings focused on the waterlilies and variegated colored trees in the distance. The impressionistic rendition of the foliage contrasts with the glass like reflection on the lake. It feels as if you are stepping into the scene in real life and admiring the view, as you walk past to view this tapestry. Claude Monet (1840-1926) was the founder of French Impressionism in the 19th century and his works of art has never been paralleled. The sense of perception was considered even more important than the subject itself, and above all things, his work never fails to give unmistakable dreamy impression that only Monet was capable of. 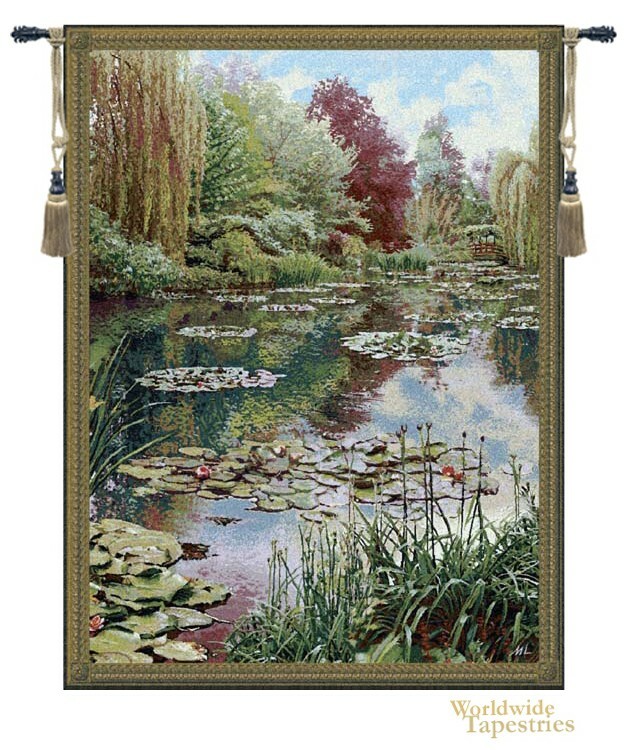 This tapestry of the gardens and lake at Giverny is backed with lining and tunnel for easy hanging. Note: Tapestry rods and tassels, where pictured, are not included in the price. Dimensions: W 40" x H 53"
Dimensions: W 68" x H 80"